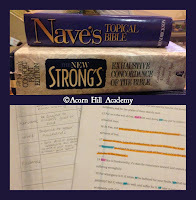 I am always looking for interesting Bible studies to use with my children. We read in our Bibles daily (well, most days) together, and discuss what we've read. I have a small commentary that we use to help us summarize points from the section we're reading, or to bring up questions about important things I don't want us to miss. I like this method and it keeps me accountable for reading with my children. 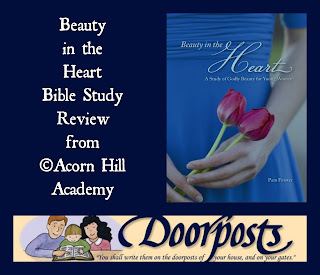 However, I like to use additional materials as well, and when the opportunity came up to review Beauty in the Heart by Pam Forster, from Doorposts, I was thrilled to take a look at it and work through a portion of it with my girls. We received a comb-bound copy of the book to use. It's intended for ages 12 and up, and I have to say that my 12 and 13 year old girls were plenty challenged by this study. I learned a lot myself. What I liked very much about this book is that not only did we learn about what comprises true beauty, we also learned the basics of different methods of studying the Bible. They recommend a Strong's Concordance, which I have, and a Nave's Topical Bible, which I didn't have, so I ordered one. 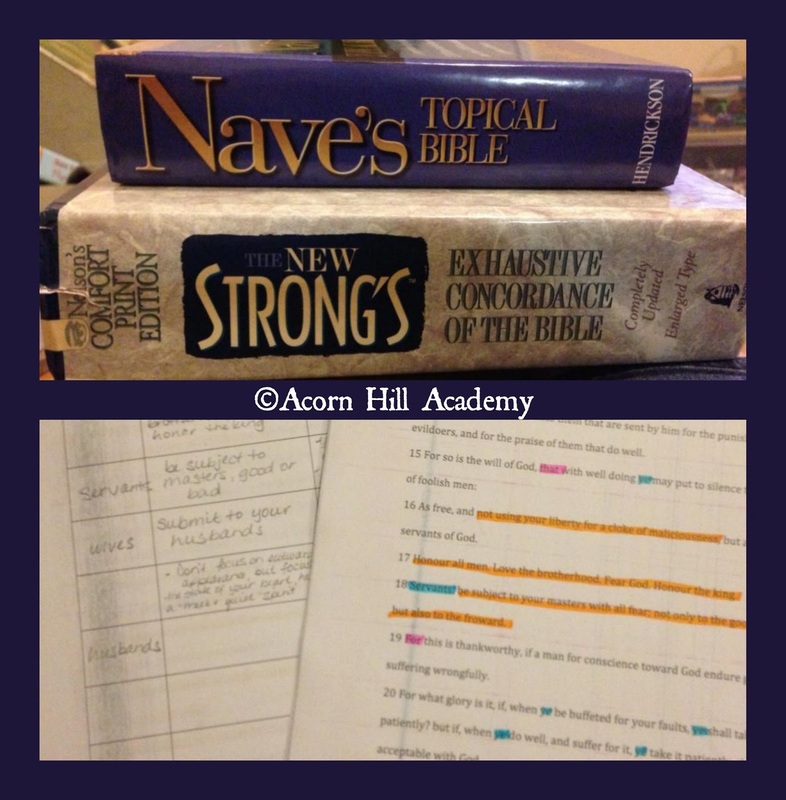 The Bible study methods include inductive study, verse study, character study, verse study, and word/topical study. Although the study is written for girls, there are alternate questions for boys included. 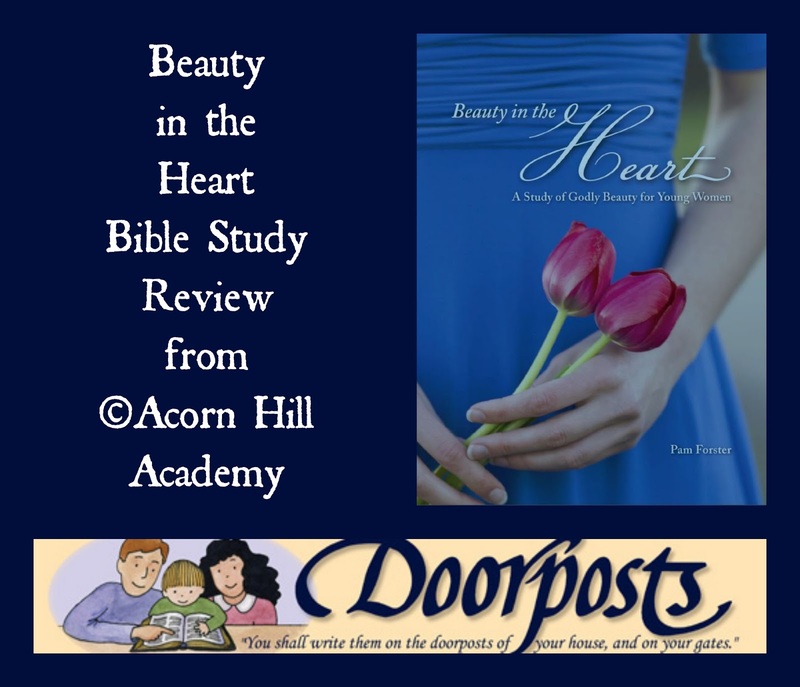 The book states that boys can encourage girls to grow in Godly beauty, and that it's important for them to learn to discern between true and false beauty in relationships as they consider marrying. We spent the review period on the first chapter, a couple days per week. The chapter is titled "Beauty in Submission," and is an inductive study of a portion of I Peter. I printed copies for us of I Peter in the KJV. We read the entire book aloud together, stopping after every few verses to narrate and discuss. Then, we used the method described to mark up our passages (we used highlighters instead of pens). We weren't quite ready to mark up our Bibles, and I have done inductive study with printouts before. For the next part of the study, I made up tables for us like the one in the book, so we could organize what we'd highlighted. We spent a few days organizing our findings and discussing them. We took our time, because we're still getting used to the KJV, and we looked up verses in other versions of the Bible if we had questions. I'm glad I decided we would work through this study together, because it is not easy going! There is a *lot* to be learned from this book. It's laid out so nicely - we read in I Peter about "the way holy women of the past who put their trust in God used to adorn themselves," and then go on to study those holy women and their stories. I love the way inductive study draws you into Scripture and helps you see the details of a passage. This is a brand-new study, available for $14.00 from Doorposts. Click to see a PDF sample here. They currently have a special offer: if you purchase the printed workbook, you can use the coupon code "beautystudy" and receive a free PDF copy of the book! This offer expires on August 31, 2013. Thank you for this. I downloaded the sample and it looks like a perfect study for me and my 14yo daughter.